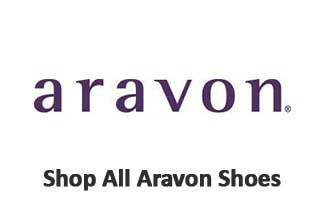 Aravon understands that we all love wearing shoes. All kinds – sandals, pumps, loafers and clogs. They understand the precise role each pair of shoes plays in a woman’s wardrobe and they applaud it. They appreciate the fact that you’ve got a million things to do and the last thing you need is aching feet. They know the damage caused by poorly fitting shoes, whether they injure the foot, ankle, knees or the ego. Aravon consists of a few seasoned shoe developers who believe that footwear should support a woman’s sense of wellbeing as well as her sense of style. That’s why they designed Aravon, casual footwear with remarkable fit, comfort, performance and style. 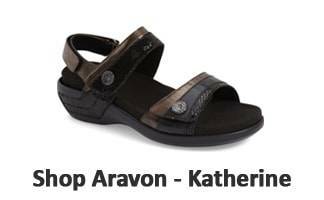 Aravon strives to provide all day comfort in each pair of Aravon shoes and Aravon sandals. With comfort engineering by New Balance, multiple sizes and widths, and a wide selection of footwear categories; Aravon has the perfect shoe for you! Why not stop by one of our five locations and try on a pair? 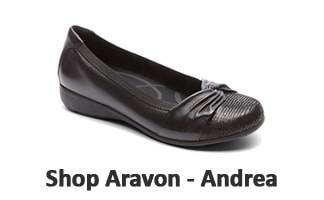 At Lucky Feet Shoes, we carry many of the Aravon brand shoes, wide shoes, sandals, heels and boots in our stores in Southern California. 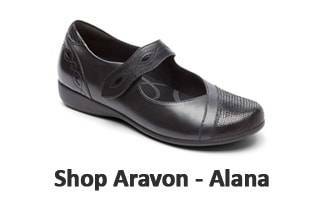 If you are looking for Aravon shoes in Orange County, Inland Empire, Los Angeles County, Temecula or Riverside, we have six stores to serve you! If you are looking for Aetrex shoes in Anaheim, Anaheim Hills, Yorba Linda, Brea, Orange, Placentia, Fullerton, Irvine, Villa Park or Tustin; visit our store in Anaheim Hills. If you are looking for Aetrex shoes in San Dimas, Glendora, Pomona, Covina, West Covina, La Verne, Azusa, Diamond Bar or Claremont; visit our store in San Dimas. If you are looking for Aetrex shoes in Rancho Cucamonga, Ontario, Upland, Fontana, Rialto, Chino, Chino Hills, Mira Loma, Eastvale, Colton or San Bernardino; visit our store in Rancho Cucamonga. If you are looking for Aetrex shoes in Riverside, Moreno Valley, Corona, Rubidoux, Loma Linda, Grand Terrace, Redlands or Norco; visit our store in Riverside. If you are looking for Aetrex shoes in the Temecula Valley, Murrieta, Fallbrook, Lake Elsinore, Wildomar, Hemet, San Jacinto, Pala, Sun City, Menifee, Canyon Lake, Perris, Bonsall or Anza; visit our store in Temecula.